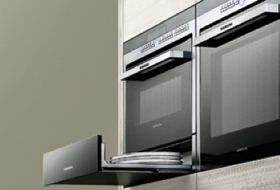 Siemens StudioLine ovens are in their second generation with the new Black finish replacing the Stainless finish which distinguishes them from the rest of the Siemens oven range. 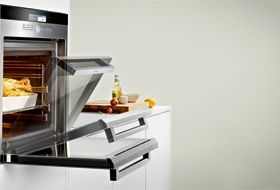 Siemens always lead in innovation and the second generation fo StudioLine appliances are no different, innovative technology and a highly distinctive design are the core values of the Siemens StudioLine range. The latest editions to the range include he multifunction HN878G4B6B, with Pulse Steam and Microwave functions and features a High resolution TFT display, elegant studioLine handles and stylish telescopic rails. 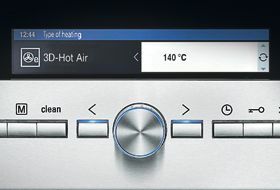 A temperature probe and soft close door and WIFI home connect add to this top of the range oven from Siemens. Adding to the range is the HS858GXB6B which adds full steam functionality to the range, and includes High resolution TFT display, StudioLine styling, soft close door and WIFI home connect. Two compacts finish the oven range with the CN878G4B6B StudioLine oven with Microwave function and the CS858GRB6B StudioLine oven with full steam function. Both features High resolution TFT display, soft close door and WIFI home connection features. To complete the oven line up is a Siemens StudioLine warming drawer BI830CNB1B and BV830ENB1B vaccum drawer which perfectly match the Siemens StudioLine range. The new, high resolution colour TFT display makes it easier than ever to check your oven’s settings, whatever angle you’re reading from. 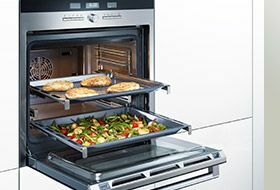 studioLine ovens come with telescopic rails as standard. The shelves glide out effortlessly and safely, allowing you to position, check and remove your food easily. The softClose feature controls the oven door mechanism, so it always closes softly and quietly, so you can carry on with the cooking, undisturbed. The compact45 appliances such as the multi-function oven with microwave and the combination steam oven are perfectly complemented by our warming drawers. Placed next to the large capacity oven, these line up perfectly thanks to the linear design and matching control panels. The temperature probe gives you complete control over your cooking. 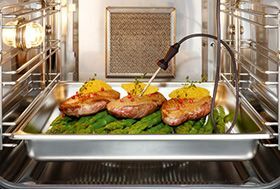 It will monitor the exact core temperature of your meat, so whether rare, medium or well done, you can ensure your meal is cooked to perfection every time.